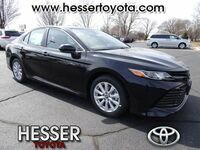 As we celebrate 30 years of one of the most trusted and beloved vehicles on the market, get behind the wheel of the 2014 Toyota Camry serving Elkhorn WI to enjoy what three decades of excellence is like. In its 30 year reign as one of the most relied upon vehicles in the automotive industry, the Toyota Camry has given families and individuals across the globe an undeniably solid performance and innovative ride. In the last ten years alone, 90 percent of Camrys sold are still on the road. 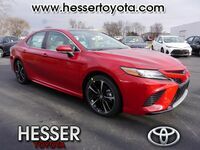 Still delivering the drive its passengers have come to love, the 2014 Toyota Camry serving Elkhorn WI is has an effect so strong on its drivers that it has truly become a member of their families. Available with a variety of powertrain options and trim levels, the latest Camry can be fully customized to suit the needs of each driver, and with any choice they can feel confident behind the wheel. 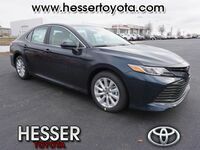 Interested in a 2014 Toyota Camry? When equipped with the 3.5-liter V6 engine, the all-new Camry can create an available 268-horsepower performance. When the Camry Hybrid utilizes its 2.5-liter 4-cylinder Atkinson-cycle engine, the vehicle pumps out up to 156 horsepower and with the vehicle’s Hybrid Synergy Drive electric motor, the vehicle produces up to 200 horsepower. Not only does the Camry exude dependable strength, it also creates one of the cleanest drives on the road. 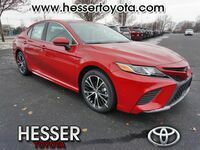 The athletic V6 engine earns the Camry an EPA-estimated 31 mpg highway, the 4-cylinder offers an EPA-estimated 35 mpg highway, and the Camry Hybrid can achieve an EPA-estimated 43 mpg city performance. What makes the Camry special is its ability to give drivers an experience in which they’re comfortable and drive they look forward to. The vehicle’s longevity is possible because drivers know the Camry is a car they can trust. In addition to the vehicle’s physical and mechanical strength, it is also just strong in its construction. As the best-selling car in America for over a decade, the Camry has given drivers a trusted performance that starts in its foundation. Not only is the vehicle built with a reinforced frame that rests on grounded wheels, it is also equipped with ten airbags and enough safety to earn the title as a 2013 IIHS Top Safety Pick. Drivers take on the road with confidence knowing their most precious cargo is protected with every mile traveled.